Serious illness hasn’t stopped Dylan Roslauski from playing goalie on his Newbury Park American Youth Soccer Organization team, the Piranhas. The 8-year-old cancer survivor has a passion for the sport. 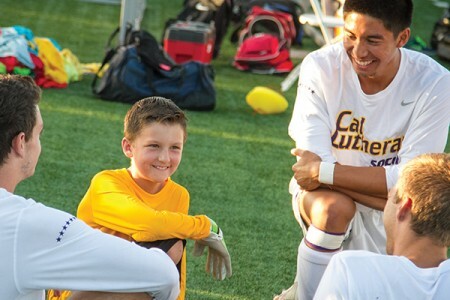 Dylan also is an honorary member of the Kingsmen soccer team. At home games, he mingles with players during pregame warm-ups, high-fives starters as they’re introduced on the public address system, and fires up the huddle by leading the chant, “One, Two, Three – Kingsmen.” At practices, he keeps players loose with his impish antics and enthusiasm. Bolton and his wife, Elle, both of whom are cancer survivors, started Cancer Fit Inc. this year to help adults and children bounce back physically from chemotherapy and radiation. MVP Sports Draft focuses on children in the first five years after treatment ends. Without question, Dylan knows what adversity really is. When he was just 6, his parents, Rob and Christa Roslauski, noticed a bump on his head. They didn’t think much of it at first, but when the bump didn’t go away, they took him to the doctor. A biopsy and further tests revealed Dylan had B-cell lymphoblastic lymphoma, a rare type of cancer of immune cells that usually strikes children. Dylan endured weekly chemotherapy treatments for the first 10 months following his diagnosis, causing his weight to drop from 60 to 45 pounds and sapping him of all his youthful energy. He underwent two years of chemotherapy in all, forcing him to miss third-grade classes at Maple Elementary School and do his lessons at home. He also lost his hair. The good news is Dylan’s cancer is in remission and he’s gained back his weight – and then some (in September, he scaled 75 pounds). His hair’s back, too, and he’s in school. Dylan was introduced to the team and coaching staff at a Draft Day signing ceremony held at Rolland Stadium in August. He received a certificate and team photo signed by his teammates as well as goalie gloves signed by the goalies. During practices, Dylan loves showing his “nutmeg” technique to unsuspecting Kingsmen players. That means he kicks a ball between their legs when they’re not looking. If he’s successful, the player is required to do 20 pushups. “Yeah, I’ve been a victim. I think everyone on the team has been a victim and some have had it done to them a couple of times,” said team captain Alex Wardle, a defender who also serves as a liaison between the team and Dylan’s parents. Dylan has joined his teammates for lunch on occasion, and he regularly shares Instagram photos with players and communicates with some of them on Facebook. But he lives for game day. When Cal Lutheran opened the season by hosting the Kingsmen Kickoff Classic, Rob Roslauski said, Dylan was “all ready to go” at 3:30 p.m. for a 7:30 evening game. He wore the gold jersey given to him by Kingsmen players, with black shorts, orange shoes and green goalie gloves. “We’ve definitely seen a change in his disposition since he began the program,” said Dylan’s mother. “He’s become more confident and his strength has increased a lot.” She added: “In a short period he has become more of a leader on his own team,” the Piranhas. John Cressy is a freelance writer who works in public relations for Whisenhunt Communications of Ventura and teaches writing skills to probation officers. He is a former staff writer, columnist and sports editor for the Ventura County Star.